In the 1881 census Eliza is two years old and living with her father William, age twenty-four, a police constable, mother Eliza, thirty, brothers Frank, five and John W. two months and sister Elizabeth, three. They were living at 110 Blidworth Road, Kirkby in Ashfield. Owing to her father’s job the family had move around. Frank was born in Worksop, Elizabeth in Shireoaks and Eliza and John in Kirkby in Ashfield. There is no trace of Eliza or her family in the 1891 census. 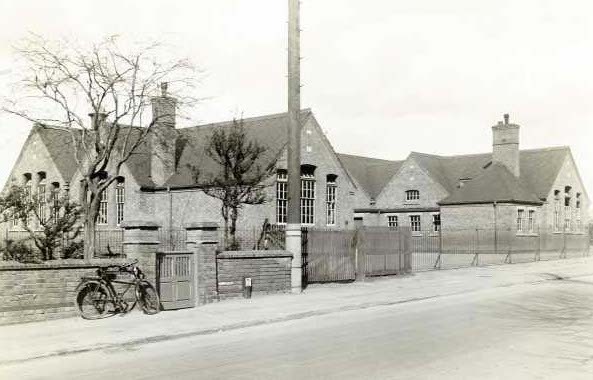 Eliza began her teaching career at Eastwood National School in 1897 as an assistant mistress and after a year she moved to the National School at Bingham where she again stayed for a year, leaving in 1900 to teach at Musters Road School in West Bridgford where she stayed until 1909. She moved to take over the headship of the Infants section at Radcliffe on Trent. In the 1901 census she is a twenty-two year old school teacher living with her father William, who is now a Police Superintendent, her mother and a younger sister Nellie, age fifteen who was born in Skegby. They are living on Church Street, Bingham. In the 1911 census Eliza is 32, single and a school teacher. They are now living at the Police Station in Bingham. Her mother had died on 25 June 1910. Also living with them are her sister Nellie now 25, single and recorded as a housekeeper and a grand-daughter Nellie Martin, age 15 and born in Eastwood. Her father was remarried in 1913 to Bertha E. Nicholson in Bingham. She maintained her position as headmistress at the school. She was absent from school in July 1918 in order to see her brother who was home on leave. Many of her former pupils were on active service. In November 1918 the school was closed due to the influenza epidemic and did not re-open until January 1919. Eliza was also absent suffering from influenza but fortunately survived and returned to her duties in mid March. Eliza is shown on the electoral rolls from 1918 as the occupier of one of the Twin Cottages on Bingham Road, Radcliffe on Trent. She was the headmistress at the school up until she died in 1927. Her will shows that she was living in Twin Cottages on Bingham Road, Radcliffe on Trent and that she died a spinster on 4th February 1927. Administration was granted to her father William, a retired Police Superintendent. She left effects of £704.2s.8d.